One sure fire way to create just about any new successful business is when you combine multiple interests into a single business plan. If you love what you're doing then you'll never have to work a day in your life. 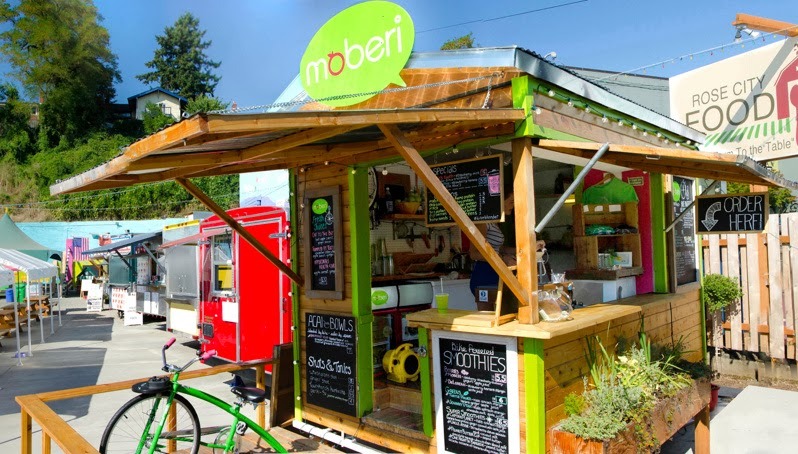 That's exactly what Ryan Carpenter, from Portland, Oregon did by combining his love for vintage Schwinn Bikes, Smoothies and Fresh Juice when he started the bike powered Moberi Smoothies Business. 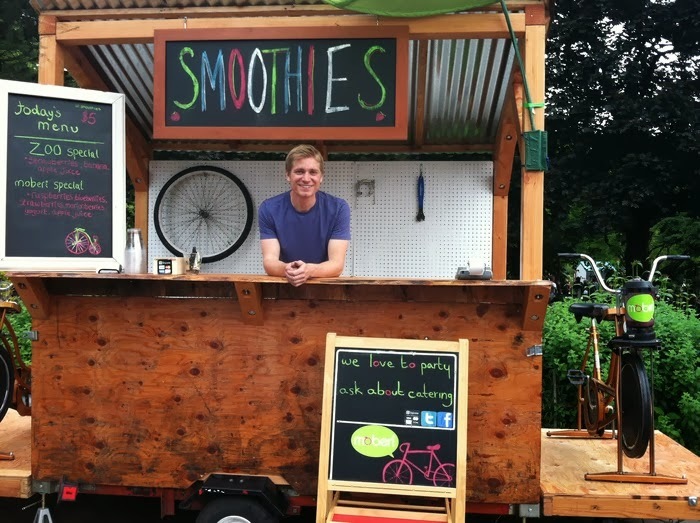 The idea of making fresh Smoothies using old Schwinn exercise bikes soon took over, and before Ryan knew it, he bought a small trailer and transformed it into the very first Traveling Moberi Smoothies Bar. By the looks of this early picture of the Moberi Bar in the process of being built, its clear Carpenter's enthusiasm to make his bike powered Smoothies a Big Success was just a matter of time. Ryan developed a list of his favorite Smoothies recipes, and then combined a little marketing power by getting the customer's to provide the actual mixing. As with all Food Cart Vendors, creating an atmosphere where customers hang around always creates more customers who want to see what all the fuss is about. If you really think about this concept, the Moberi Smoothies Business has a built-in guaranteed way to draw and hold potential customers attention like no other competing vendor can compete with. Developing a recipe for success, Carpenter turned to Kickstarter. com to raise the much needed capital to finish the very first Moberi Smoothie Business. With a reasonable goal of $6,000.00, Ryan was able to raise this amount which was successfully funded in May of 2013. From what I can tell, two new Moberi Smoothie locations are opening in the Portland area on North Mississippi and NW 23rd street. Moberi's first location at the Rose City Food Park was shut down this past winter so apparently Ryan can concentrate on these new locations. It's kind of interesting Carpenter's only promoting his appearance on the Shark Tank on the Moberi Blog with no mention on FaceBook or Twitter. I guess that's better than nothing, but it sure seems like a good time to start gaining a little momentum for this unique way of getting the customers involved in making Smoothies. As far as the Sharks go, having only one location when Ryan went into the Shark Tank, and recently received the Kickstarter funding, this may be a little early for them to invest in. The Sharks might not be interested in Moberi Smoothies, (that's my guess anyway) but I can easily see these becoming a Big Hit at just about any large State Fair, Sporting Event and of course Food Court's around the country. I thought that this was a pretty great concept. Very surprised they didn't invest, especially given his profitability. I agree! I'm overweight, and I'm not really smoothie drinker, but I think this would be a lot of fun to try. It would also be a very motivational job to have: getting paid to ride an exercise bike and make smoothies for people! So if a fat girl is interested in it... LOL Seriously though, I could also see these working great at health food stores and fitness clubs.